Want to know who will win today? In Today Dream11 Fantasy Cricket Prediction CSK vs RR 43rd T20 Match IPL 2018, we will cover playing 11, pitch report of Sawai Mansingh Stadium, Jaipur, toss prediction. We will also cover players recent and past performance, weather report of Jaipur, dream11 best team, the best choice for captain and vice-captain, key players, dream 11 guru prediction, all the latest news and updates of Chennai Super Kings and Rajasthan Royals, where to watch the live match of RR vs CSK and live streaming details. All the details that we provide are taken from very reliable sources. Make sure to read the complete post to get 100% benefit. All the details in this post are completely free and you don’t have to pay a single penny. Try to read all the section of the post as each section has some important tips and tricks of dream 11. Where Can You Watch the Live Streaming of CSK vs RR or Channels to Watch? Who Will Win the 43rd Match of IPL 2018 Between CSK vs RR and Toss Prediction? What is the best combination of players for Dream11 in 43rd Match? Date: The match will be played on 11th May 2018 (Friday). 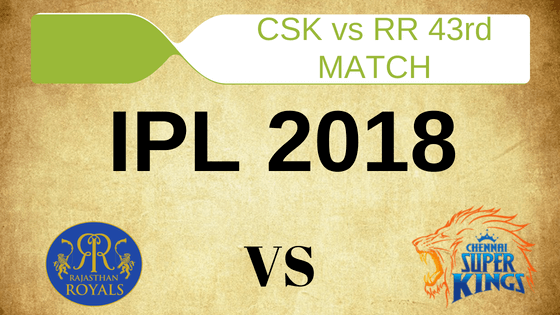 Match: Indian Premier League, RR vs CSK, IPL 2018. The pitch of Jaipur, Sawai Mansingh Stadium is very difficult to bat on as the pitch slows down as the match progresses. Although the batsman who will play sensible shot can make a big score. The spinners will get a turn from the pitch. There is something for the seamers also if they hit the bowl in the right area with variations. In Jaipur, there will be some clouds but the sky will be clear before the match. Cricket fans and fantasy users can watch the full match as no rain is expected. The temperature is expected to be 38-Degree Celsius and the humidity to be 13%, which may rise up to 18%. In last five matches, RAJ has won one match out of five matches whereas CHE has won four games out of five games. In overall encounters, RR has won 6 matches and CSK has won 12 matches. In this venue, both the teams have equal wins. Star Sports has paid a huge amount of INR 16,347.50 Crores to get exclusive rights of IPL 2018 for live coverage for five years starting from 2018 to 2022. Star Sports has all the media rights including TV and all Digital Rights. You can watch the full match of Chennai Super Kings vs Rajasthan Royals, 43rd match on Star Sports. Suresh Raina, MS Dhoni (c & wk), Sam Billings, Shane Watson, Deepak Chahar, Ambati Rayudu, David Willey, N Jagadeesan, Dhruv Shorey, Murali Vijay, Dwayne Bravo, Monu Kumar, Lungi Ngidi, Imran Tahir, Ravindra Jadeja, KM Asif, Karn Sharma, Harbhajan Singh, Mark Wood, Chaitanya Bishnoi, Shardul Thakur, Kshitiz Sharma, Faf du Plessis, Kanishk Seth. Krishnappa Gowtham, Ajinkya Rahane (c), Prashant Chopra, Heinrich Klaasen, Anureet Singh, Jos Buttler (wk), D’Arcy Short, Rahul Tripathi, Sanju Samson, Shreyas Gopal, Dushmantha Chameera, Jofra Archer, Ben Stokes, Aryaman Birla, Stuart Binny, Jatin Saxena, Mahipal Lomror, Ben Laughlin, Dhawal Kulkarni, Jaydev Unadkat, Sudhesan Midhun, Ish Sodhi, Ankit Sharma. Chennai Super Kings and Rajasthan Royals, both the teams have won their last game and will be high on confidence. RR will play in pink jersey to promote cancer awareness and want their record to improve from this match. It will be interesting to how both the team make changes in their playing 11. We will provide you with the probable playing 11 in the next section. Played 10, won 4 and lost 6 matches. RR won their last match and will not try to change their team but they may think of few changes like Shreyas Gopal can get a chance in place of Binny Stuart or Mahipal Lomror. Except for these changes, Rajasthan Royal will go with the same team. Jos Buttler (wk), Ben Stokes, K Gowtham, Jofra Archer, Ish Sodhi, Ajinkya Rahane (capt), Sanju Samson, Stuart Binny/Shreyas Gopal, Mahipal Lomror/Shreyas Gopal, Jaydev Unadkat, Anureet Singh/Dhawal Kulkarni. CSK has done fairly well in this IPL and would like to book their spot in top two in the points table. Right now they are at the 2nd position with 14 points. Death bowling is a concern for Chennai Super Kings but as they won their last match they may not think of changing their team. However, they may bring Karn Sharma in. It is expected that Dhoni will play with the same playing 11. Shane Watson, Suresh Raina, MS Dhoni (capt & wk), Ravindra Jadeja, Harbhajan Singh, Shardul Thakur, Ambati Rayudu, Dhruv Shorey, Dwayne Bravo, David Willey, Lungi Ngidi. Pro tips: Both the players are good. You can take anyone from the above. Make a combination of the above players for multiple teams. Pro tips: The above bowlers will take wickets. Make a combination of players from the above players. Pro tips: The above players are most likely to perform. You can take them as a captain and vice-captain. You can also take captains from key players. Both the teams have won their last matches. RR has to win this match if they want to qualify for the playoffs. On the other hand, CSK will want to finish in the top two position. Chennai Super Kings is a strong team. Cricket Expert say that CSK will win today. According to our astrology prediction, CHE will win today’s match. The team winning the toss should bat first as defending is easier on this ground. According to our astrology prediction, RR will win the toss and they will ask CSK to bowl first. The pitch is expected to be slow and it will get slower as the game progresses. Try to take spinners in your teams. Try to take more of all-rounders. Try to take Jadeja and Krishnappa Gowtham in your team as they will perform today. Jos will open for RR so he is also a good option. Conclusion: This is it for Today’s Dream11 Fantasy Cricket Match Prediction of CSK vs RR, 43rd T20 Match, IPL 2018 which will be played on Friday 11th May. You can give your valuable feedback in the comment section. Subscribe to our notification of latest updates. GOODBYE! Hey Anup, As per our Information Short is not playing.